I've got a little wishful thinking going on here today. 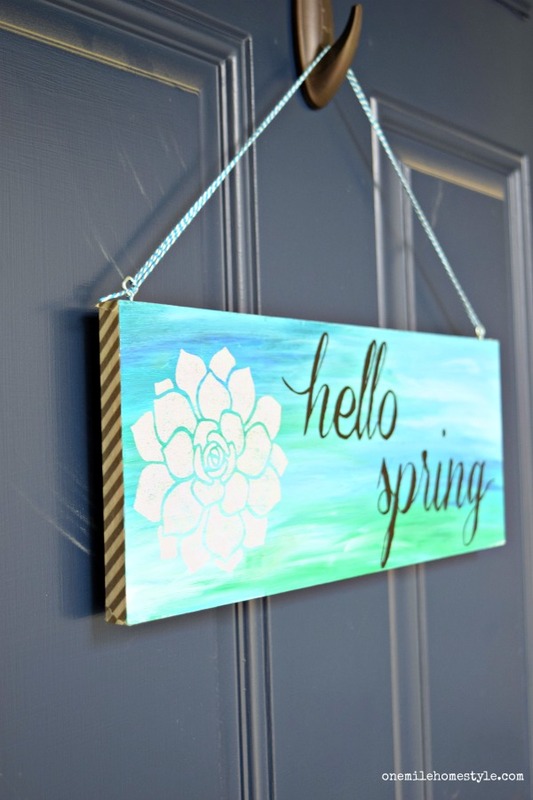 While my DIY wood sign says "Hello Spring" and is full of bright spring color, it's so not feeling like spring around here yet. Hopefully, this little sign will get the temperature around here moving in the right direction! 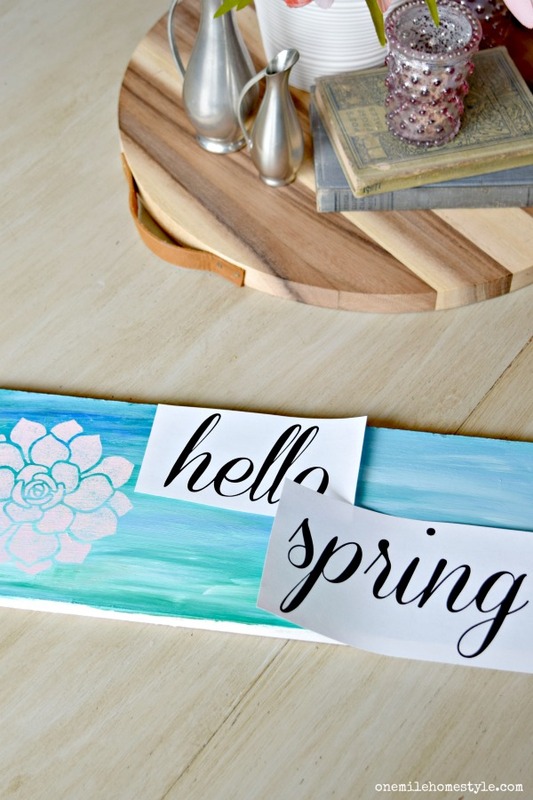 I joined up with a few friends today to bring you a little springtime inspiration to brighten up your home, links to all of these great ideas are at the end of this post, check them out! This is a super easy DIY project that is great for beginners, or as a fun little project to complete with kids. You don't need to be an artist, and the supplies required are minimal (you may even have everything you need at home right now). 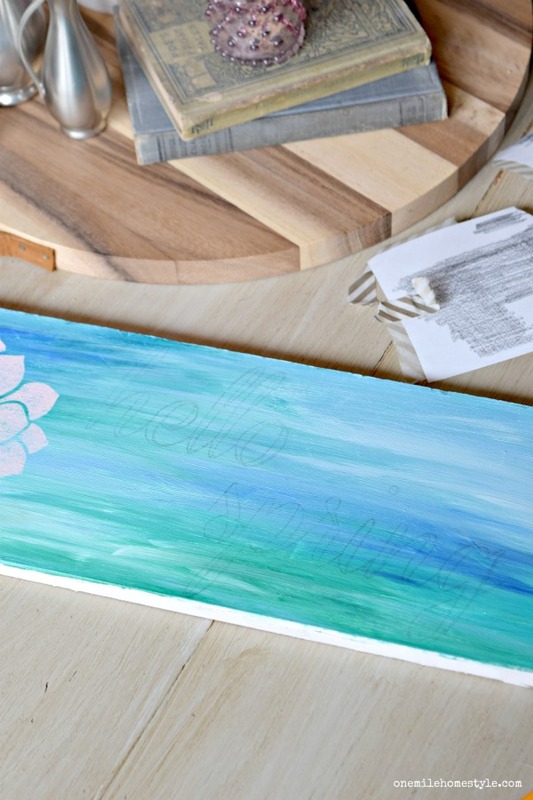 Start with a piece of scrap wood, any size will do, and give it a base coat of white paint, and let it dry. Pick the colors you want for your background, I picked a cobalt blue, turquoise, green and white. 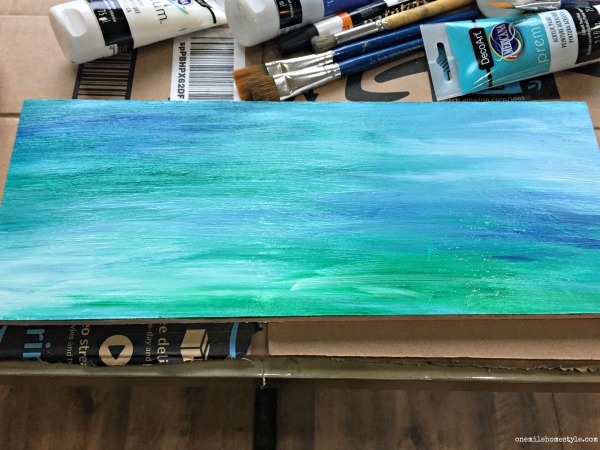 You will add a couple of drops of each color directly on your board and with a paintbrush blend the colors until the entire board is covered. You can use any colors you like, I picked these because they look like a nice bright spring day. Let this coat of paint dry thoroughly. 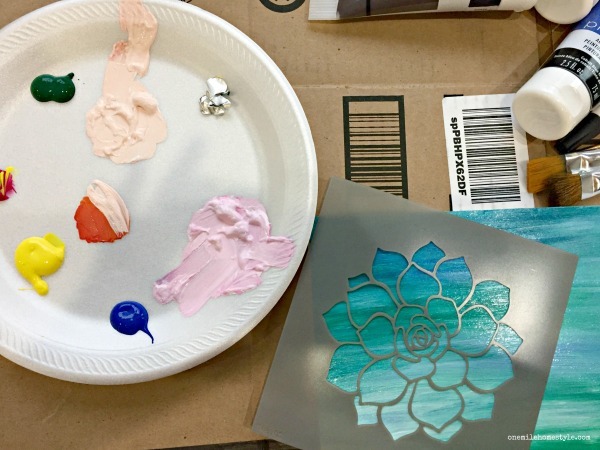 Stenciling is a great way to add detail without needing to be an artist. I had this flower stencil in my supply stash, and the size ended up being perfect for this wooden sign. I mixed up a shade of super light pink and super light orange to use for my flower. I lighted stenciled on one color, then layered the other color right on top. I did this a couple of times with each color, and used a light touch so some of the background color would still show through the design. Next up was adding the text, and I will tell you right now, that hand lettering is not my strong suit, so anytime I want hand-painted lettering, I have to cheat a little. And now I'm going to show you my secret to hand lettering, it's so easy! First, print your selected phrase, cut it out and test fit it to your sign. Second, grab a pencil and scribble all over the back of your paper. Third, tape your paper down to your board so it doesn't move, and using your pencil again, trace over the outline of letters. This transfers the pencil marks to your sign so you can easily paint on your lettering. Remove your paper templates, and you are now ready to paint! 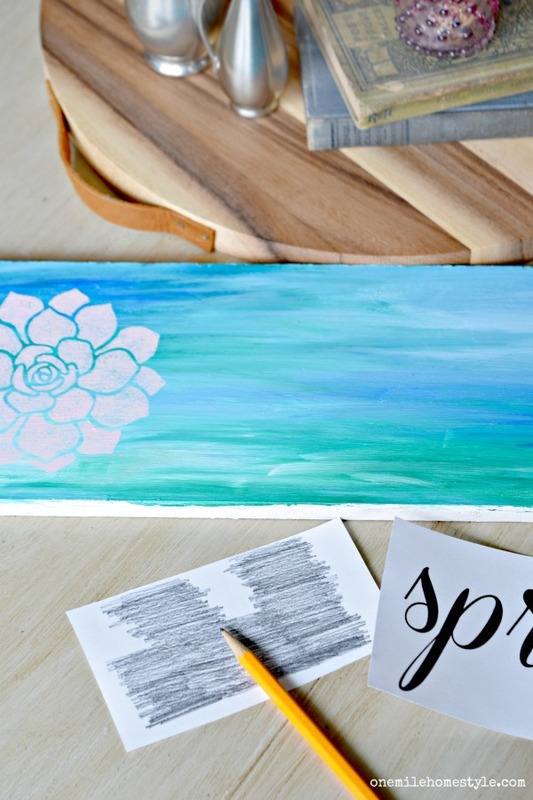 Using black paint and a paintbrush (or a paint pen), paint over your penciled letters. 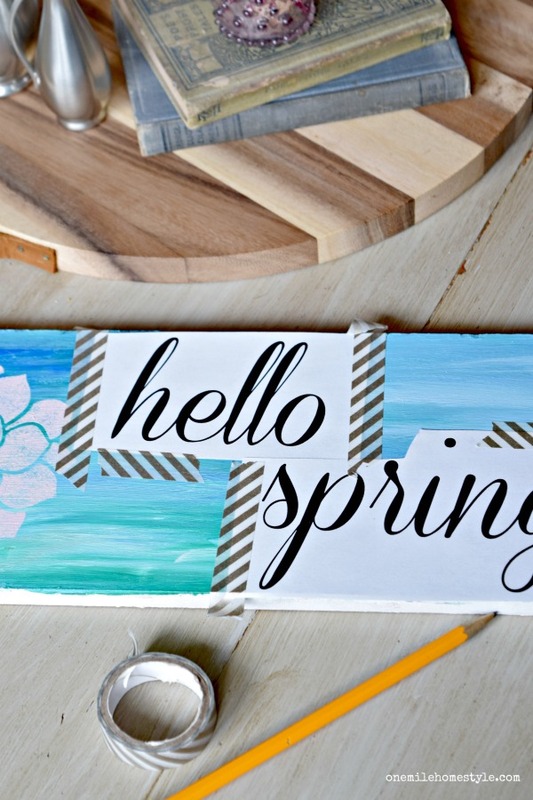 Once all the paint has dried, add a couple of eye hooks and some twine, and your hello spring wood sign is ready to hang. 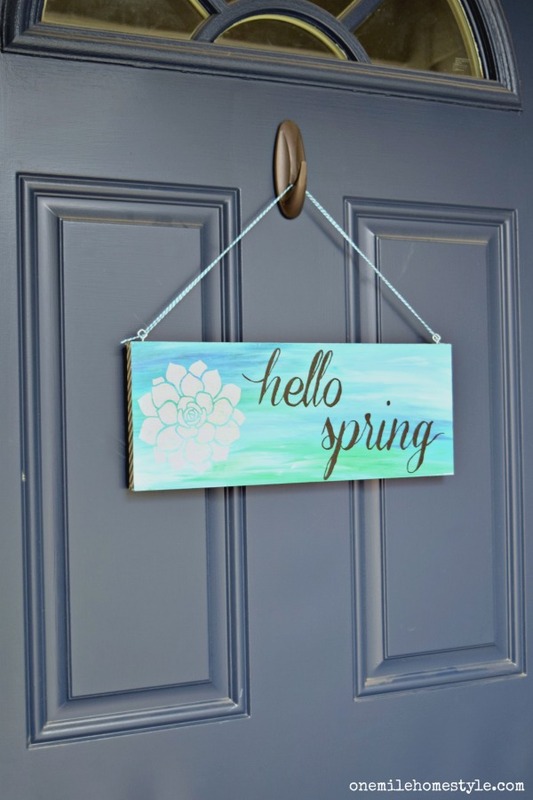 It is the perfect little spring home decor addition inside or out! (If you do hang it outdoors, you may want to use a sealer to protect it from the elements.) I originally planned to hang this inside, but I think it looks so cheery on the front door, so it may just stay right here! Want to see a little trick I used to finish the edges of this wooden sign? I just grabbed some gold striped washi tape and wrapped it around all the edges. It gives is a nice finished look, added a fun little extra detail, and was easy!! 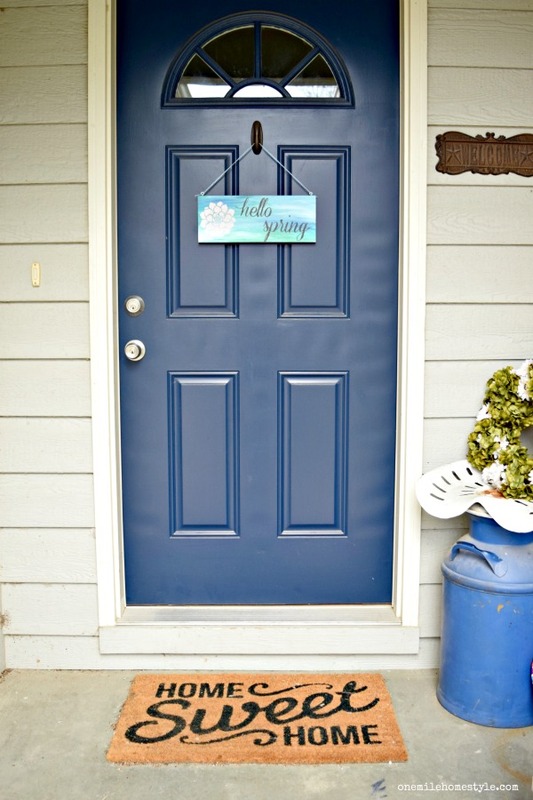 Now the front door is all dressed and ready for spring, I'm just waiting on the warmer weather! The Inspired Makers Tribe are bringing you all the spring decor and inspiration you need to kick the winter blues! This sign is so pretty and I love the flower stencil. I also love the color of your door! Your porch looks like spring. Thanks Sarah! I'm so happy we went with the bold blue door color! AHHHHH! I think I finally understand the pencil transfer method. 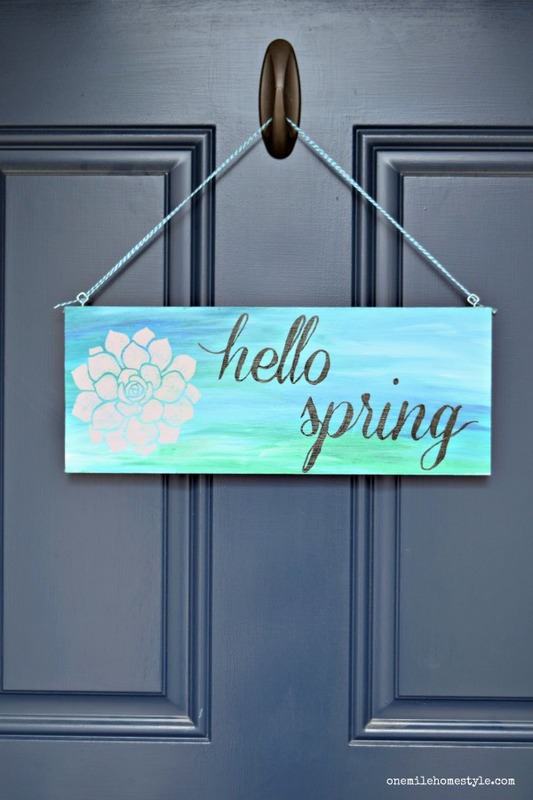 I love you springy little sign. It's so easy Lisa, and it makes sign making so much easier! This is one of my favorite ways to make signs because my lettering is terrible. I take it one step further and fill my letters in with a Sharpie marker....cuz I've been known to mess up painting my letters. I've done paint pens too, and almost did it with this one, but thought I would give painting a try. I think the pens are much easier to work with!! Thanks Toni! I'm going to do a separate blog post on the background since I was a bad blogger and didn't photograph the process for this project. I have only used chalk, I never thought to use a pencil! I feel like pencil is SO much easier and neater than chalk, and so much easier to see! I'm giving it a try soon, and I love this sign! The edges are adorable! I have used chalk too, this is much neater, and with the chalk, I was always afraid I was going to accidentally wipe off the outline as I was working!